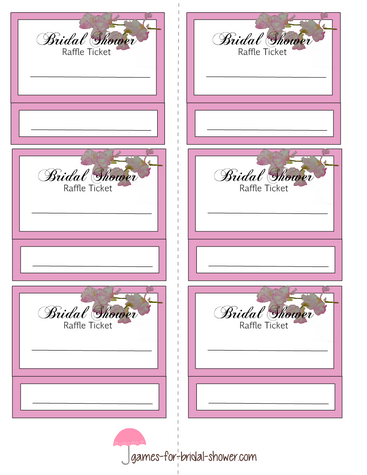 You can use these Raffle tickets to play a fun and interesting door prize game with your bridal shower party guests. This is a fun game and guests will wait with pounding hearts holding the raffle ticket in their hands till the winner is announced. 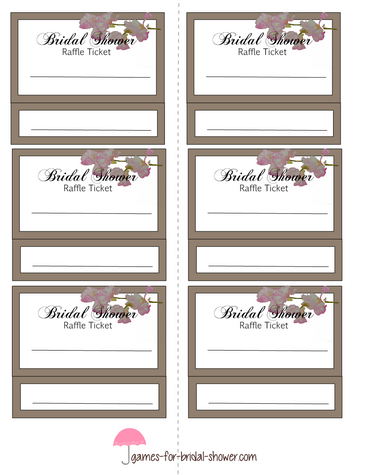 How to Play: First take a print out of these raffle ticket templates according to the number of your bridal shower party guests. Each printable page offers 6 Raffle tickets. Now you can play this Game in two ways, 1, Write a different number on each card. You have to write the number both on the upper and lower section of the cards. When the guests enter, give each guest one ticket and put it's lower part in a jar. When all guests have arrived, ask the bride to draw a ticket from the jar and announce the lucky winner's number . The person who will have the ticket with that number will be the winner. 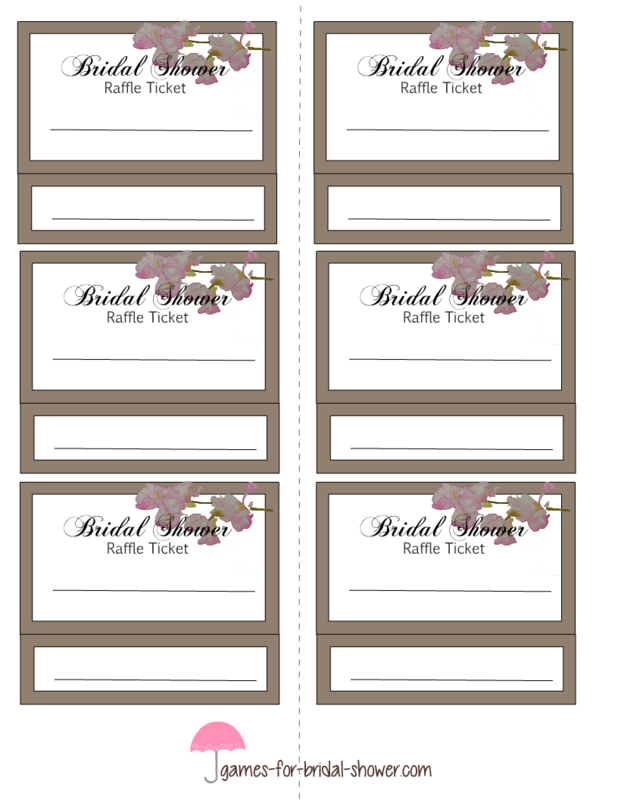 2, When each guest arrives you can write their full names on both sections of the raffle tickets and then bride-to-be will draw a name in the same way as mentioned above. Make sure that you write full names as there is a chance that two women with same name will attend a bridal shower. 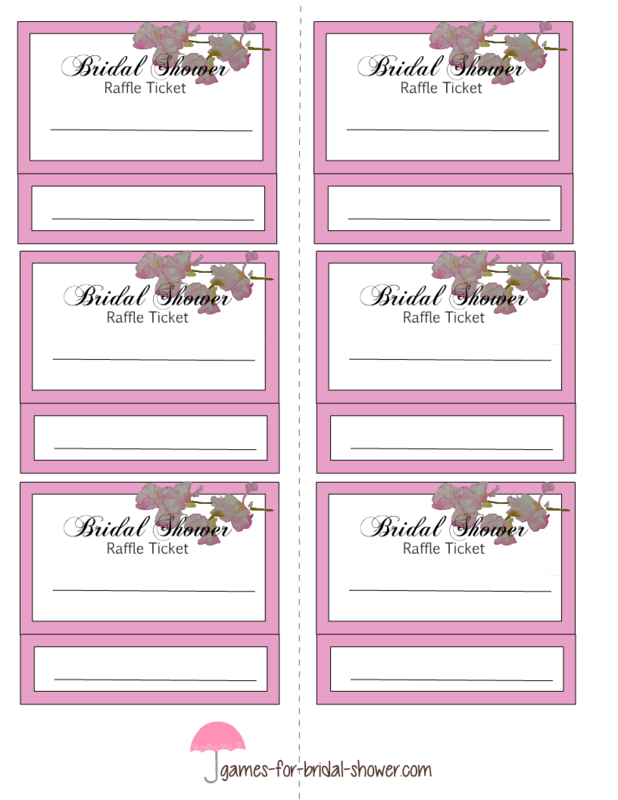 Click on the image shared above to save this raffle ticket template in pink color or you can choose any other color that goes with your bridal shower party theme better. If you think that Lilac color will match your bridal shower's theme better than click on the image above and save the bigger version of these bridal shower raffle tickets in lilac color. Click on the image shared above to save these raffle ticket in brown color. These tickets are classy and a pink flower gives these a cute look.